Built in 1859, the Island Hotel is constructed from seashell tabby with oak supports. Its walls have withstood hurricanes for almost 150 years, and its sloping wooden floors have survived the passage of innumerable feet. Built as the general store and post office, it has changed little over the years. 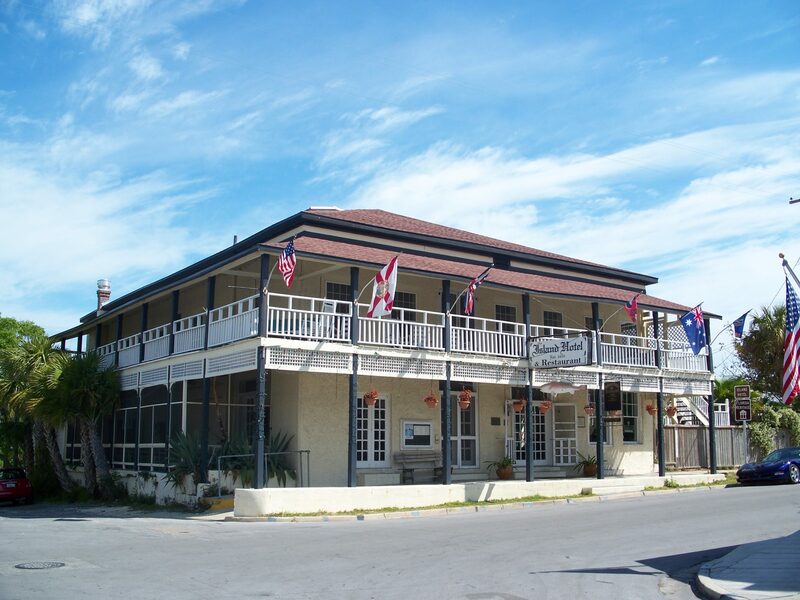 Sit on a rocker on the long balcony and watch the sun set over the Gulf, relax in our informal and cozy lounge bar, painted in 1948 with murals of Cedar Key and King Neptune, for whom the bar is named, the only bar in Levy County without a television! Or just spend a relaxing morning or evening in the hotel lobby and reflect on years past when the lobby of a hotel was the center of social activity. Strike up a conversation with a stranger who is looking for just exactly what you are...a relaxing and comfortable break from the hectic world that exists outside of Cedar Key!